Global Processed Fruits and Vegetables Market size was valued at over USD 245 billion in 2018 and is anticipated to witness a CAGR over 6.5% up to 2025. 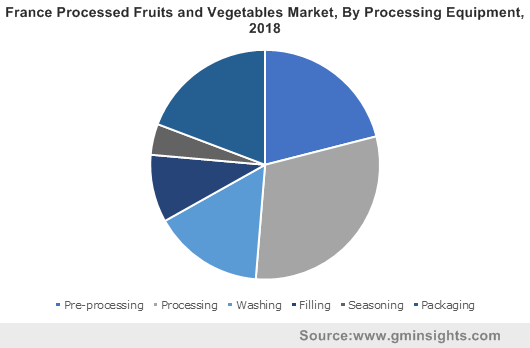 Changing lifestyles owing to hectic schedules and rapid urbanization accompanied by ready availability and improved product offering will drive the processed fruits & vegetables market growth. Factors such as prolonged shelf life, introduction of advanced processing methods, increasing disposable income, and the expansion of the middle-class population supporting industry expansion. Technological advancements and rise in demand for processing equipment coupled with increasing global trade levels for food is expected to boost the industry size. Strong demand for organic foods with use of natural flavors ingredients owing to rise in health consciousness and favourable government policies will augment the product penetration. Preserved fruits are increasingly used in diverse applications such as bakery, fruit juices, ice cream, and confectionery owing to long shelf-life offered by processors. Further, demand for clean label and natural products is among the key factors driving the product usage. Also, the varying consumer dietary patterns owing to the influence of vegan lifestyle are positively influencing the processed fruits and vegetables market. Other important factors such as rise of the geriatric population, increasing consumer expenditure supported by growing count of supermarkets & hypermarkets have contributed to the business expansion. The consumers of developed economies such as the U.S. and Europe are becoming increasingly aware of the benefits of consuming nutrient locked fruits and vegetables which is further fuelling the market growth. Stringent regulatory guidelines by organizations such as the FDA, USDA, and European Food Safety Authority (EFSA) regarding product labelling and improving nutrient intake will proliferate the industry growth. Processed fruits accounted for more than 35% of market share in 2018. Growing imports & exports for apples, bananas, and citrus fruits owing to increased demand for juices and exotic fruits is propelling the product scope. Positive outlook for fruit jams and marmalades will support the industry share. Key benefits such as reduced risk of chronic diseases, immunity bolstering, and skeletal development will enhance the market growth. Processed vegetables segment is projected to grow at a substantial rate up to 2025. Ease in product availability along with enhanced demand for organic vegetables will stimulate the market growth. Rapid urbanization in developing countries supported by penetration of online sales channel and supermarkets offering multiple products at lower prices is escalating the industry expansion. 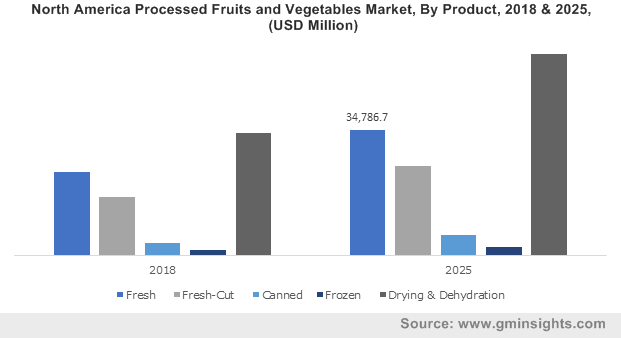 Additionally, adoption of integrated and automated vegetables processing equipment will augment the processed fruits and vegetables market growth. Fresh produce segment is projected to surpass 200 million tons by 2025. Increase in popularity of natural as well as organic products is generating new opportunities for the manufacturers. Further trends towards consumption of exotic fruits particularly in Europe and North America will surge the business advancement. Products such as papaya, avocado, pomegranates have become popular due to their healthy characteristics. Fresh products such as sweet potatoes, mangoes, and avocadoes have seen a strong annual growth rate owing to retail discounts and increased consumer spending on exotic fruits and vegetables. Dried and dehydrated fruits and vegetables will observe the fastest growth over the forecast timeline. Dry fruits help to boost fiber & nutrient intake and ensures judicious supply of antioxidants. Prolonged shelf life of dried and dehydrated fruit and vegetables products allows healthy consumption and quality retention which will help to meet demand of health-conscious consumers. Dried and dehydrated products can be opted as snack option by consumers who are looking for personality enhancement. 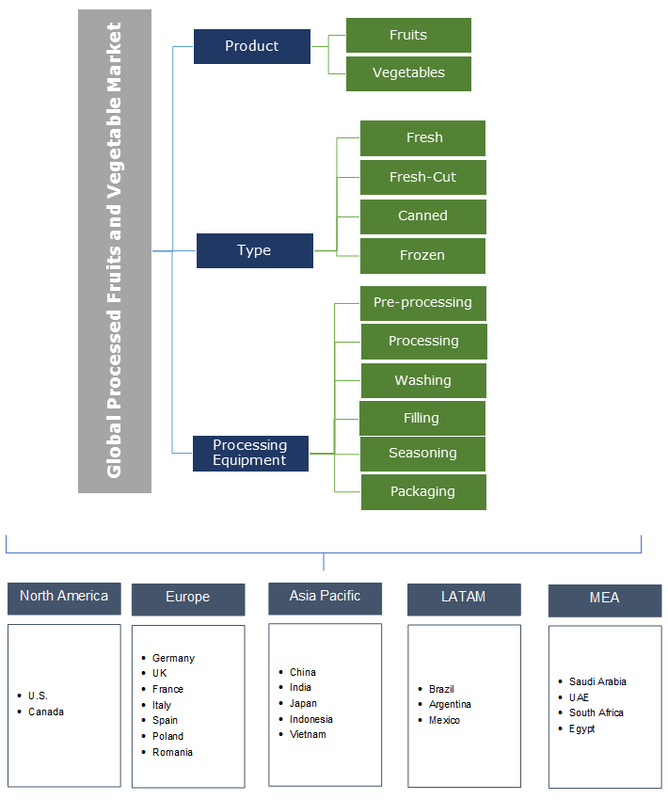 Processing equipment accounts for over 30% revenue share in the processed fruits and vegetables market. The technology helps in avoiding the task of slicing and peeling thus offering convenience, thereby driving the market growth. Also, availability of fully automatic and semi-automatic equipment used in fruit and vegetables processing industry offers improved safety, saves time and faster packaging. Packaging equipment is projected to witness the fastest growth over the forecast timeframe. Advanced packaging solutions and attractive packaging offered by key industry participants to increase their product sales will help to proliferate the market growth. Innovations in packaging has helped to develop products with smaller quantities, thus offering variety to the consumers. Antimicrobial packaging techniques helps fresh produce products to retain their texture and composition which helps to offer consumer, products in their natural form thus enhancing the market growth. 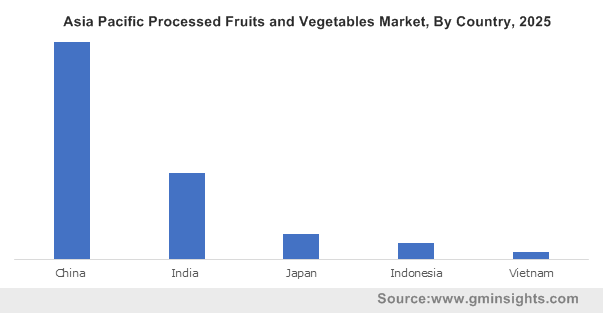 North America accounted for more than USD 75 billion in the global processed fruits and vegetables market in 2018. The industry in this region is inclined towards technological advancement for production of fresh fruits and vegetables along with updated processing technologies for end use industry. The steady growth of U. S population generates higher demand for fruits & vegetables due to increasing obesity related diseases and health-consciousness. Asia Pacific will generate notable gains at around 7.5% CAGR from 2019 to 2025. Innovative and convenient fruits and vegetables ingredient solutions are offered to food processing companies accompanied by increasing count of supermarkets in the region, is proliferating the industry growth. Strong demand for dried fruits owing to increasing per capita income and availability of imported products will promulgate the product penetration. Aspects such as large geriatric population particularly in Japan, economic growth, and busier schedules, and urbanization positively influence the industry advancement. Global processed fruits and vegetables market share is highly competitive owing to the presence of dominating players such as SVZ, Archer Daniels Midland Company, Sysco Corporation, Conagra Foods and Nestle. The other notable industry participants include B&G Foods, Pinnacle Foods, Bunge, and Agrana. Expanding production capacity, new product development, mergers & acquisitions, and supply chain agreements are among the key strategies adopted by major industry players. For instance, in February 2019, SVZ USA enhanced its production capacity in Othello, to meet the growing demand in North America. The key challenges faced by the manufacturers/processors are the stringent regulatory scenario and high capital investments for equipment which ensure consumer safety. Processed fruits & vegetables provide vitamins, minerals, fibers, phytochemicals and antioxidants. Presence of this nutrients helps in reducing cholesterol levels and avoiding heart diseases. Locally sourced, natural or organic, or sustainably grown fruits and vegetables observe strong growth due to increasing health consciousness among consumers. Technological innovations in food processing equipment industry along with increase in cold storage capacities is propelling the industry share. Globally flourishing food service industry, increasing awareness about the advantages of fruits & vegetable consumption, decreasing imports & superseding export demands, and industrialization regulations implemented by the governing authorities are the key factors supporting business growth. Additionally, expansion of urban & rural areas, continuously changing consumer lifestyle, and the noteworthy growth of food service industries are also fueling the industry expansion. Increasing instances of a food recall, coupled with a complex supply chain, and high inventory carrying cost may hamper the development of the market.